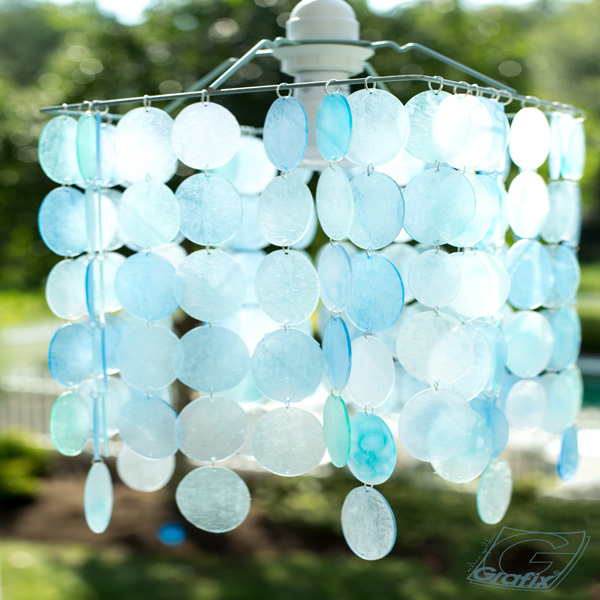 Project Description: Use translucent sanded shrink film to create pieces that look like beach glass which can be strung together and hung from an inexpensive lamp shade frame to create a one-of-a-kind light fixture. This would be an amazing gift any homeowner would be sure to cherish (if you can bear to part with it!). Note: The colors will intensify when the shrink film is heated. If in doubt, test the color on a scrap of shrink film. Die cut ovals from shrink film. Note: This project takes time to create! Plan accordingly and pop in a good movie (or two), or better yet, enlist the help of a friend. Approximately 170 ovals were used in the project as shown. Use mostly the two largest size oval dies, with a few of the third largest size mixed in. Remember that the shrink film will shrink by at least half. Punch a hole close to the ends of each oval using a 3/16” or ¼” hole punch. The hole will shrink along with the rest of the piece. Color the ovals with a variety of shades of blue and aqua (or colors of your choice). The colors will intensify when baked, so if you are in doubt, try a test piece first. Use a spray gun to vary the shading or color by hand to create a more even coverage. The sample has both as I thought it added to the “beach glass” feel. 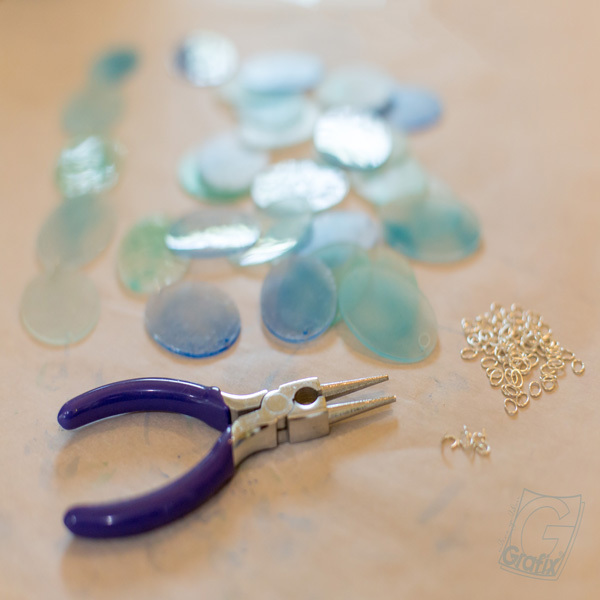 Leave a few uncolored to create the white translucent pieces. Tip: To create something that looks like a capiz shell chandelier (and save lots of time) leave all the pieces uncolored. Follow manufacturer’s instructions to shrink the film using an oven or heat tool. Tip: The combination of oven temperature and baking surface can produce varying results. Also, larger pieces can sometimes warp or become twisted during baking. To prevent this, try placing the shrink film on a cookie sheet between two layers of parchment paper. 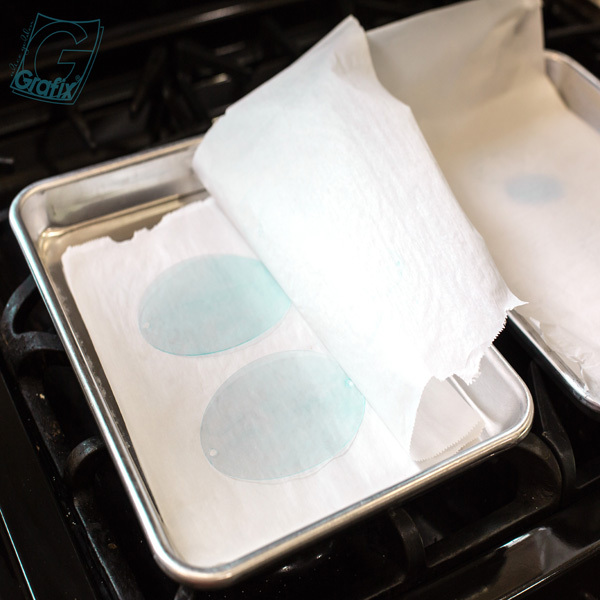 Place a lightweight brownie or bread pan on top to cover the shrink film. I also found that baking at a lower temperature for a longer time worked best. Additionally, I baked only two at a time to help minimize the pieces sticking to each other while baking. These ovals were baked at 300 degrees F for 6 minutes. 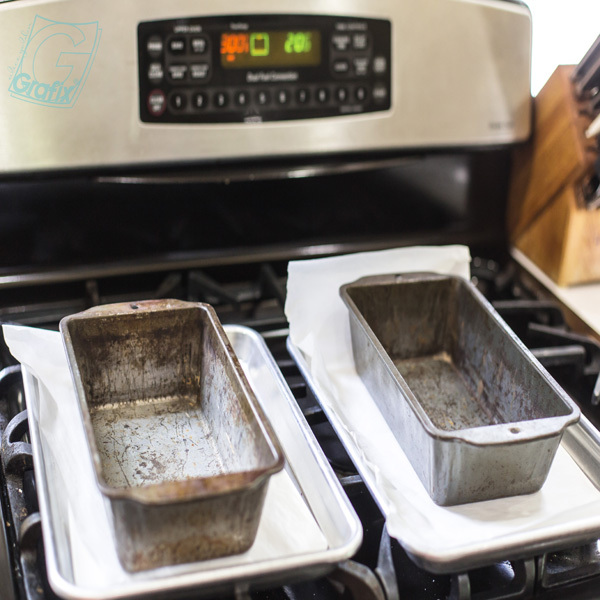 When they come out of the oven, keep the bread pan in place and cool for several minutes to help the pieces stay as flat as possible. Lay out the ovals first so you can create a nice variation in color; then create strands of five ovals attached with the oval shaped jump rings. To get a nice full look you will want 8 or 9 strands per side. On two of the strands, add an additional oval to vary the length of the strands. Remove the paper shade from the Orgel frame and sand any hard to remove spots. Spray paint with Krylon spray paint and primer using two or three light coats. Allow to dry between coats. Attach strands of ovals to frame using round jump rings. The frame can be used in either direction depending on your preference – with the wires pointing up so that they are visible from the top and you can see a bit of the light bulb, or with the central wires pointing down which creates more of a modern, streamlined look. Tip: Vary the shape of the die and/or color scheme. Create long strands of “beads” to use as a door in a teens room. Possibilities are endless!